Discussion in 'GPS Tracks - Central, Texas & Gulf States' started by Cannonshot, Nov 12, 2010. 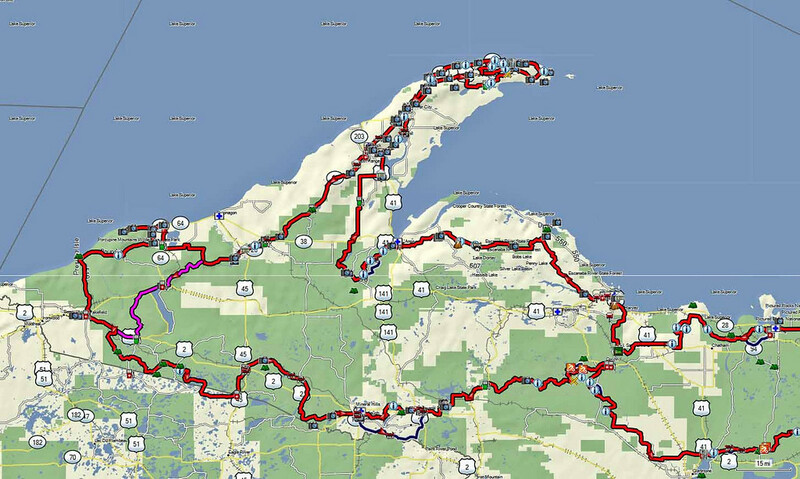 The Upper Peninsula Adventure Trail is a dual sport ride I put together that covers much of the Upper Peninsula of Michigan over a distance of between 1200 and 1300 miles. The primary route is intended for small-medium dual sport bikes. So that people that ride big dual sport bikes can enjoy the trip, I put go-arounds in for sections that are not appropriate for big bikes. I have three GPX files to share. The first file contains all of the tracks (big bike and primary). It allows people to see it all in one file and put together a custom combination of big bike go-arounds and the primary route if they so desire. Two other files are ready to load big bike or primary files. Load them and go. Download the three GPX files here. I made revisions to the GPX files based on some land use changes on The Keweenaw Peninsula. Thank you for all your efforts.... downloaded and can't wait for next year with my wife on these. She's looking forward to the east half of the UP... she's been as far east as Grand Marais. Looking forward to a ~5 day trip that roughly covers the same areas as the 'Trek. As a sidenote, these tracks combined with your other UP tracks make the UP configurable for any time frame/skill level. Hey Cannonshot, nice looking track. Seems like the wrong time of year to start the trip though. I'm still hoping you'll give http://www.dualsportmaps.com a try. We need contributers of your quality to really firm up this project. I've been following the ride report, looks fantastic!!! I have the week before central rally off next year, this is on my to do list. Thanks much Cannontracks, got the route uploaded into Mapsource. I see the average # track points around 325 + -. I can't remember what my Zumo 550 max out at per track. I will need to look that one up. Great route for about June of 2011. I can get around 10,000 track points before my Zumo barfs. It is partially a function of how much is on a routeable road in the Zumo database. How early in the spring could this be ran without running into alot/if any snow? Thanks for the posted tracks. I know the immense effort creating the old UPDS Safari. It isn't a pimple on the backside of the effort to create these. I'm looking forward to the comfort of the big bike version of UPAT on my KLR. Thanks all. I'm happy to be able to help out. It is nice to be able to hand off a ready to ride track for others to enjoy. Hope you all get to have a great trip with this track. Like Ed says, it takes a lot of effort - but it is worth it to see others get to enjoy it. FYI: Costco has the Garmin 60CSx on sale for $199 with free shipping. That 60 series will serve you will. Hope you get a chance to enjoy this ride next season! Wooohooo... just found out that G'ma wants the boy for a week in June.. The wife and I have 8 days to ride the whole thing, and she's stoked to see all the eastern stuff. I was planning the big bike route only for her, but I'm not sure what I'm gonna ride. Husky 610 or the KTM990R.... hmm... I don't wanna do the go-arounds. Most of them don't appear to be that long.... and it gives my wife a chance to dawdle and me a chance to ride my pace. I know the KTM will be a handful, but.... Cannon? Take the 990. You can always hand pick go-arounds if you don't like something. Or take them both, ride the TE east and the 990 west switching halfway through. Sounds like you have a great trip planned. Plenty of time to relax and look around while minimizing the hardships on the missus. You might run into some others on the trail during that time as well. After a weekend of singletracking at Tomohawk (Wolverine) - I set off on the UPAT solo. Crossing the bridge was a bit hairy. Due to construction - I had to ride on the metal grate for quite a distance. Yikes! 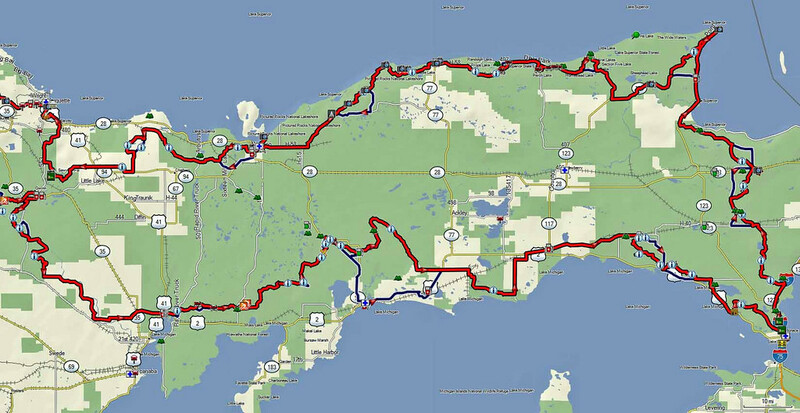 Once in the UP I was a little bored at first by a few roads with one turn every 5 miles. But that didn't last long and was well worth the wait! The ride had everything sand, road, woods, sand, scenery, sand, lighthouses. Did I mention sand? This was the first time I've ridden my 990 on sand and did I learn a lot. Gas it and lean back. Since I only had limited time I cut the loop in half at Gwinn and made it back to Wolverine in one (long) day. Loaded up the trailer and headed back south to home in Indiana. Thanks Cannonshot! The route information was flawless. And yeah - you warned me about the saaaaand. 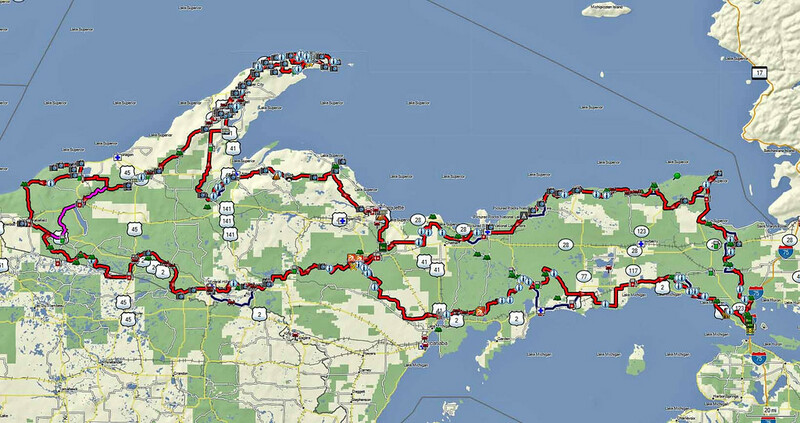 Starting tomorrow.... Marenisco to Copper Harbor!